Maya Beiser in concert Thursday. Paola Prestini invited listeners into her sensually saturated dreams on Thursday night at the Isabella Stewart Gardner Museum’s Calderwood Hall, presented by Beth Morrison Projects as part of the museum’s “Stir” contemporary music series. 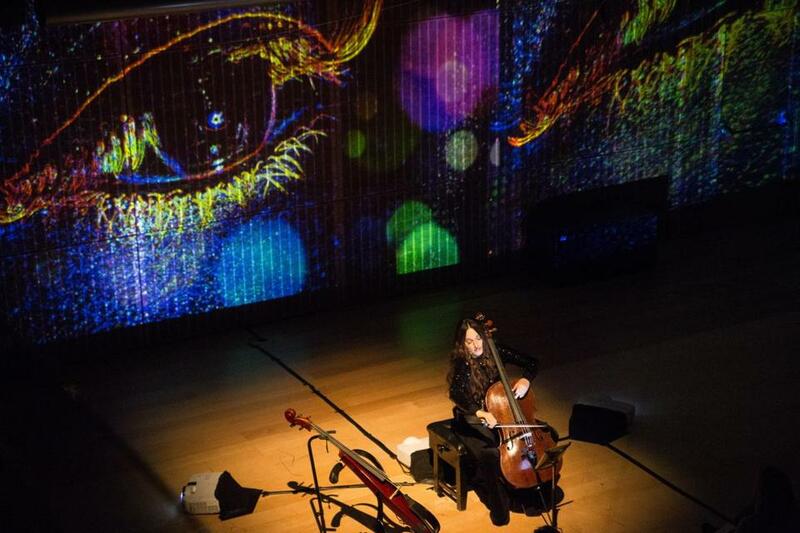 Soloists Tim Fain, violin, and Maya Beiser, cello, performed the two captivating concertos of Prestini’s “Labyrinth,” surrounded by a phantasmagoria of visual projections. Rather than the orchestra or piano reductions typical of concertos, the soloists of “Labyrinth” are accompanied by prerecorded sonic landscapes. The first half, the introspective “House of Solitude,” cast Fain as an individual soul, grasping for connection in wandering short phrases and frantic arpeggios. Carmen Kordas’s visuals of rivers running red, infinite staircases, and human bodies in kaleidoscopic close-up balanced on the line between beautiful and terrifying, though they were often unidentifiable projected on the hall’s slatted walls. The backing track — a violin fading in and out, the heartbeat from an electrocardiogram, off-kilter chanting — sometimes propelled the soloist’s line forward, sometimes embraced it as equal. Fain himself was restless, swaying back and forth in his black high-tops as if tossed about by the wind blowing through the abandoned house projected behind him. Eventually, the turmoil calmed into a resilient folk song-like melody as the individual departed. Maya Beiser was a force of nature in “Room No. 35.” Wielding her instrument like a lightning rod, she careened through virtuosic passages, grafting angular, dark edges onto her phrases. Behind her, Technicolor jellyfish waved their tentacles, and surreal sea plants with human lips smiled eerily. These images, by Erika Harrsch, were vivid and fantastical enough to stand out against the walls, and seat-shiftingly visceral at times. Beiser did not seem so much to react to the images as summon them at her whim, and the sections with nothing projected on the walls proved that this concerto could absolutely stand alone. She seamlessly slipped between solo chromatic strife and serene bliss amidst her own recorded cello choir textures. Near the end, images of stars behind her, she exchanged her acoustic cello for an electric skeleton of an instrument. That in hand, she moved delicately and uncannily created alien sounds with abyssal power. Beiser’s resume is replete with multimedia works, and as co-creator of “Room No. 35,” she brought a profound understanding to the performance. The evening’s first half was good, but the second was otherworldly, the kind of experience that will likely prove almost impossible to replicate with any other performer. Zoë Madonna can be reached at zoe.madonna@gmail.com.